One of the most powerful ideas to come out of the last decade of astronomy is that there exists a ‘star-forming main sequence’ of galaxies. The name is shamelessly stolen from the ‘stellar main sequence’, the tight relationship between the surface temperature and luminosity of hydrogen-burning stars that’s been known about for over a hundred years. This is not very imaginative, but what do you expect from astronomers? Don’t get the two confused! The galaxy main sequence is a tight(-ish) observed relationship between the mass of a galaxy and the rate at which it’s churning out new stars. 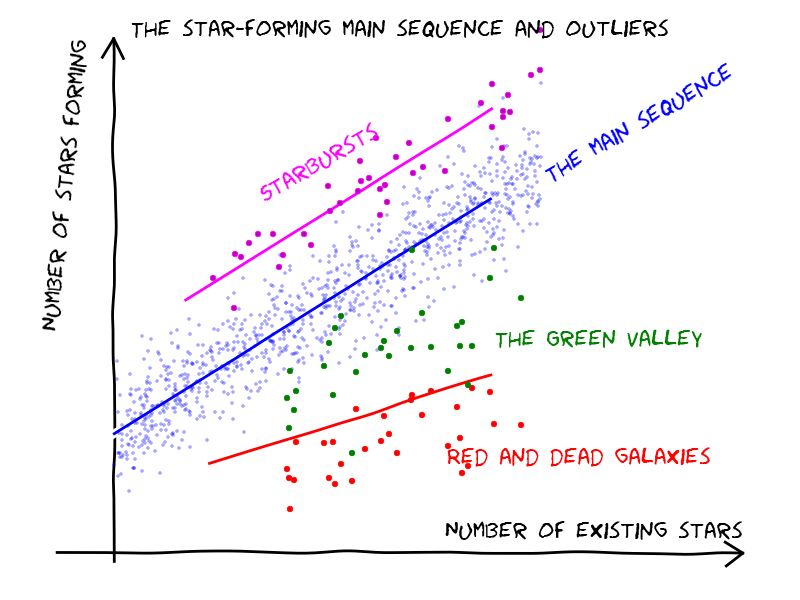 Figure 1 shows this in cartoon form: galaxies are thought to mostly lie on this sequence, with some others briefly forming many stars in a short period of time in a ‘starburst’ event. Others have stopped forming stars altogether (‘red and dead’ galaxies). The prevailing theory is that star-forming galaxies gradually move along the sequence, growing in mass and simultaneously increasing the pace of star formation, until eventually star formation ‘quenches’. At this point the galaxy falls off the main sequence, swiftly moving through the ‘green valley’ into the passive ‘red and dead’ state. However, this picture is far from uncontroversial – the physical meaning of the galaxy main sequence remains up for debate. Today’s paper is a challenge to this paradigm. The current theory came about through observing many actively star-forming galaxies, but the authors prefer to consider a representative sample of local galaxies (taken from the Herschel reference survey). It can be seen (Figure 2) that when they do this there is not really a very clear star forming sequence (the figure shows galaxy mass vs. specific star formation rate, i.e. 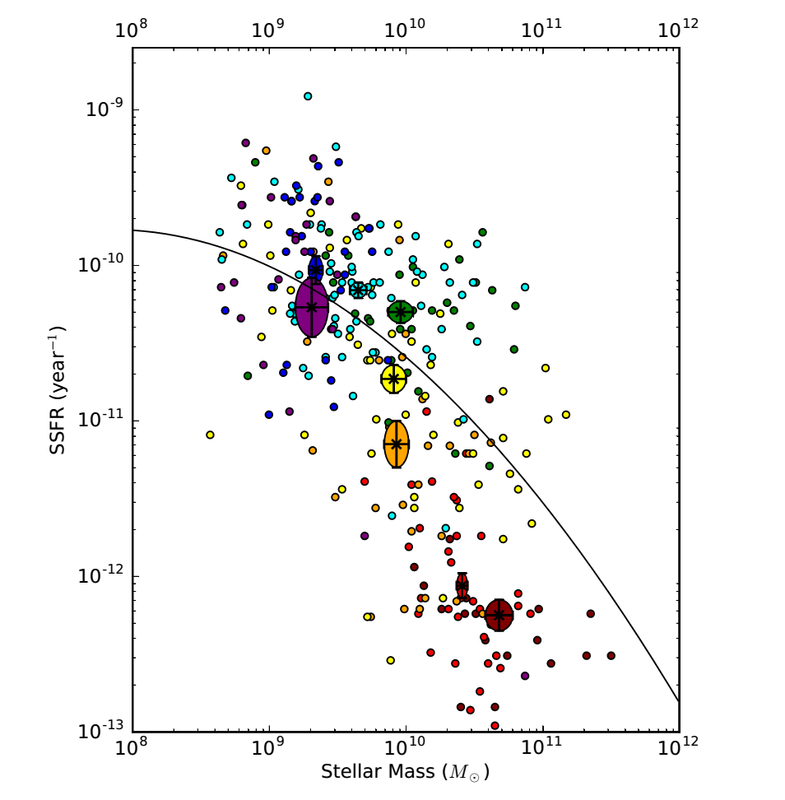 star formation rate divided by total mass) separated from the outliers. Indeed – perhaps more importantly – it appears that these local galaxies form a fairly smooth distribution, rather than being distinctly split into galaxies that are forming stars (on the sequence) and those that aren’t (off the sequence). What’s more, they seem to vary smoothly in morphology (the way they are shaped) from spiral to elliptical, as if along the Hubble tuning fork, rather than there being a sharp division between star-forming spiral and dead elliptical galaxies. The galaxies of the Herschel Reference Survey: galaxy mass vs specific star formation rate. Colours denote morphology (the shape of the galaxy), with loosely wound spirals in purple through to particularly round elliptical galaxies in red. The larger ‘blobs’ actually indicate the rough average position of galaxies of a particular type. Figure 2 from the paper. The implication of this, the authors suggest, is that the prevailing paradigm wrongly emphasises rapid shutdown of star formation as galaxies leave the main sequence, when there is in fact no clear evidence of this. This must occur in some galaxies, but it may be wrong to think of this as the dominant behaviour of galaxies reaching the end of the line: many may slowly wind down star formation instead. There are some possible objections to this idea, which the authors discuss in the paper; importantly, they are able to show that galaxies in their picture still appear to be separated into two distinct red- and blue-coloured populations, despite the fact that they form a smooth distribution in star formation rate. Only one thing is certain: there’s sure to be more healthy debate about the nature of the galaxy main sequence in the years to come!